Important Note! This article was written for Gulp 3.x, but now Gulp 4.x is out and recommended. Like any major version change, APIs have breaking changes. If you install Gulp 4 and try to do some of the things in this article, they won't work. We'll make some notes of that sprinkled through here to remind you. This looks like a pretty good Gulp 4 starter. This is not a comprehensive list of things Gulp can do. If you're crazy enough, you can even build a static site generator with Gulp (I've done it!). So yes, Gulp is extremely powerful, but you'll have to learn how to use Gulp if you want to create your own customized build processes. So that's what this article is for. It helps you get so good with the basics of Gulp that you can begin exploring everything else for yourself. Before we dive into working with Gulp, let's talk about why you may want to use Gulp as opposed to other similar tools. Tools like Gulp are often referred to as "build tools" because they are tools for running the tasks for building a website. The two most popular build tools out there right now are Gulp and Grunt. (Chris has a post on getting started with Grunt here). But there are others of course. Broccoli focuses on asset compilation, one of the most common build tool tasks. There are already multiple articles covering the difference between Grunt and Gulp and why you might use one over another. You can check out this article, this one, or this if you're interested in finding out more. Brunch is similar in its focus on assets, and it bundles in some of the most common other tasks like a server and file watcher. The main difference is how you configure a workflow with them. Gulp configurations tend to be much shorter and simpler when compared with Grunt. Gulp also tends to run faster. Let's now move on and find out how to setup a workflow with Gulp. You'll also learn how to chain together different tasks into simple commands that are easy to understand and execute. Let's begin by installing Gulp onto your computer. You need to have Node.js (Node) installed onto your computer before you can install Gulp. If you do not have Node installed already, you can get it by downloading the package installer from Node's website. Note: Only Mac users need the sudo keyword. (See the first comment by Pawel Grzybek if you don't want to use sudo). And remember the "$" in the code above just symbolizes the command prompt. That's not actually part of the command you run. The npm install command we've used here is a command that uses Node Package Manager (npm) to install Gulp onto your computer. The -g flag in this command tells npm to install Gulp globally onto your computer, which allows you to use the gulp command anywhere on your system. Mac users need the extra sudo keyword in the command because they need administrator rights to install Gulp globally. Now that you have Gulp installed, let's make a project that uses Gulp. The npm init command creates a package.json file for your project which stores information about the project, like the dependencies used in the project (Gulp is an example of a dependency). This time, we're installing Gulp into project instead of installing it globally, which is why there are some differences in the command. You'll see that the sudo keyword isn't required because we're not installing Gulp globally, so -g is also not necessary. We've added --save-dev, which tells the computer to add gulp as a dev dependency in package.json. If you check the project folder when the command has finished executing, you should see that Gulp has created a node_modules folder. You should also see a gulp folder within node_modules. We're almost ready to start working with Gulp. Before we do so, we have to be clear on how we're going to use Gulp for the project, and part of that is deciding on a directory structure. In this structure, we'll use the app folder for development purposes, while the dist (as in "distribution") folder is used to contain optimized files for the production site. Since app is used for development purposes, all our code will be placed in app. We'll have to keep this folder structure in mind when we work on our Gulp configurations. Now, let's begin by creating your first Gulp task in gulpfile.js, which stores all Gulp configurations. The first step to using Gulp is to require it in the gulpfile. The require statement tells Node to look into the node_modules folder for a package named gulp. Once the package is found, we assign its contents to the variable gulp. task-name refers to the name of the task, which would be used whenever you want to run a task in Gulp. You can also run the same task in the command line by writing gulp task-name. To test it out, let's create a hello task that says Hello Zell!. We can run this task with gulp hello in the command line. The command line will return a log that says Hello Zell!. Gulp tasks are usually a bit more complex than this. It usually contains two additional Gulp methods, plus a variety of Gulp plugins. As you can see, a real task takes in two additional gulp methods — gulp.src and gulp.dest. gulp.src tells the Gulp task what files to use for the task, while gulp.dest tells Gulp where to output the files once the task is completed. Let's try building a real task where we compile Sass files into CSS files. We can compile Sass to CSS in Gulp with the help of a plugin called gulp-sass. You can install gulp-sass into your project by using the npm install command like we did for gulp. We'd also want to use the --save-dev flag to ensure that gulp-sass gets added to devDependencies in package.json. We have to require gulp-sass from the node_modules folder just like we did with gulp before we can use the plugin. We can use gulp-sass by replacing aGulpPlugin() with sass(). Since the task is meant to compile Sass into CSS, let's name it sass. We'll need to provide the sass task with source files and a destination for the task to work, so let's create a styles.scss file in the app/scss folder. This file will be added to the sass task in gulp.src. We want to output the eventual styles.css file to the `app/css` folder, which would be the destination for gulp.dest. We'll want to test that the sass task is working as we want it to. To do so, we can add a Sass function within styles.scss. If you run gulp sass in the command line, you should now be able to see that a styles.css file was created in app/css. In addition, it has the code where percentage(5/7) was evaluted into 71.42857%. That's how we know that the sass task works! Sometimes we need the ability to compile more than one .scss file into CSS at the same. We can do so with the help of Node globs. FYI: Gulp-sass uses LibSass to convert Sass into CSS. It's much quicker than Ruby-based methods. If you want, you can still use Ruby methods with Gulp by using gulp-ruby-sass or gulp-compass instead. Globs are matching patterns for files that allow you to add more than one file into gulp.src. It's like regular expressions, but specifically for file paths. When you use a glob, the computer checks file names and paths for the specified pattern. If the pattern exists, then a file is matched. *.scss: The * pattern is a wildcard that matches any pattern in the current directory. In this case, we’re matching any files ending with .scss in the root folder (project). !not-me.scss: The ! indicates that Gulp should exclude the pattern from its matches, which is useful if you had to exclude a file from a matched pattern. In this case, not-me.scss would be excluded from the match. Since we know about globbing now, we can replace app/scss/styles.scss with a scss/**/*.scss pattern, which matches any file with a .scss extension in app/scss or a child directory. Any other Sass file that's found within app/scss would automatically be included into the sass task with this change. If you add a print.scss file into the project, you'll see that print.css will be generated in app/css. We've now managed to compile all Sass files into CSS files with a single command. The question is, what good does it do if we have to run gulp sass manually every time we want to compile Sass into CSS? Luckily, we can tell Gulp to automatically run the sass task whenever a file is saved through a process called "watching". Note! Gulp Watch was one of the things that changed a lot from 3.x to 4.x. See the docs. If you ran the gulp watch command right now, you'll see that Gulp starts watching immediately. And that it automatically runs the sass task whenever you save a .scss file. Let's take it a step further and make Gulp reload the browser whenever we save a .scss file with the help of Browser Sync. Browser Sync helps make web development easier by spinning up a web server that helps us do live-reloading easily. It has other features, like synchronizing actions across multiple devices, as well. You may have noticed that there isn't a gulp- prefix when we install Browser Sync. This is because Browser Sync works with Gulp, so we don't have to use a plugin. To use Browser Sync, we'll have to require Browser Sync. We also have to change our sass task slightly so Browser Sync can inject new CSS styles (update the CSS) into the browser whenever the sass task is ran. We're done with configuring Browser Sync. Now, we have to run both the watch and browserSync tasks at the same time for live-reloading to occur. It'll be cumbersome to open up two command line windows and run gulp browserSync and gulp watch separately, so let's get Gulp to run them together by telling the watch task that browserSync must be completed before watch is allowed to run. And in this case we're adding the browserSync task. We'll also want to make sure sass runs before watch so the CSS will already be the latest whenever we run a Gulp command. 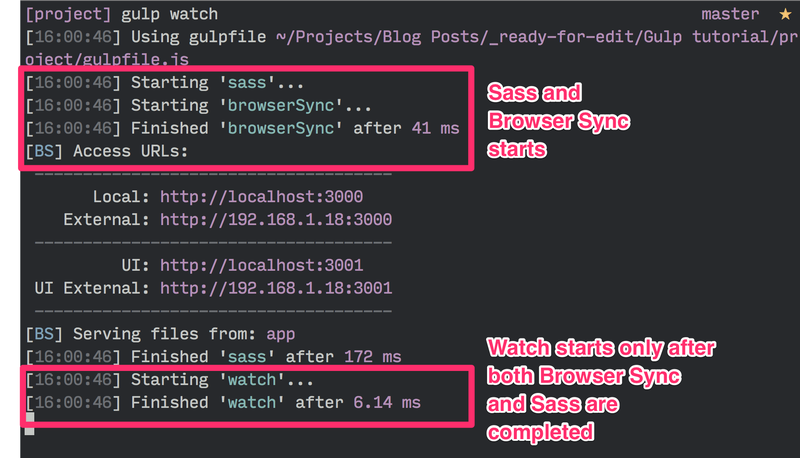 Now, if you run gulp watch in the command line, Gulp should start both the sass and browserSync tasks concurrently. When both tasks are completed, watch will run. At the same time, a browser window that points to app/index.html would also pop up. If you change the styles.scss file, you'll see that the browser reloads automatically. One problem developers face when automating this process is that it's difficult to concatenate your scripts in the correct order. Say we have included 3 script tags in index.html. These scripts are located in two different directories. It'll be difficult to concatenate them with traditional plugins like gulp-concatenate. Thankfully, there's a useful Gulp plugin, gulp-useref that solves this problem. ... HTML Markup, list of script / link tags. <type> can either be js, css, or remove. It's best to set type to the type of file that you're trying to concatenate. If you set type to remove, Gulp will remove the entire build block without generating a file. <path> here refers to the target path of the generated file. Now let's configure the gulp-useref plugin in the gulpfile. We'll have to install the plugin and require it in the gulpfile. Now if you run this useref task, Gulp will take run through the 3 script tags and concatenate them into dist/js/main.min.js. Gulp should now automatically minify the `main.min.js` file whenever you run the useref task. We can use the same method to concatenate any CSS files (if you decided to add more than one) as well. We'll follow the same process and add a build comment. We can also minify the concatenated CSS file as well. We need to use a package called gulp-cssnano plugin to help us with minification. Let's move on and optimize images next. You've probably guessed it by now; we need to use gulp-imagemin to help us with optimizing images. We can minify png, jpg, gif and even svg with the help of gulp-imagemin. Let's create an images task for this optimization process. Since different file types can be optimized differently, you might want to add options to imagemin to customize how each file is optimized. For example, you can create interlaced GIFs by setting the interlaced option key to true. You can play around with other options if you want to as well. Optimizing images however, is an extremely slow process that you'd not want to repeat unless necessary. To do so, we can use the gulp-cache plugin. We're almost done with the optimization process. There's one more folder that we need to transfer from the `app` directory into `dist`, the fonts directory. Let's do that now. Since font files are already optimized, there's nothing more we need to do. All we have to do is to copy the fonts into dist. We can copy files with Gulp simply by specifying the gulp.src and gulp.dest without any plugins. Now Gulp will copy `fonts` from `app` to `dist` whenever you run gulp fonts. We have 6 different tasks in the gulpfile now, and each of them has to be called individually with the command line, which is kinda cumbersome so we want to tie everything together into one command. Before we do that though, let's look at how to clean up generated files automatically. Since we're generating files automatically, we'll want to make sure that files that are no longer used don't remain anywhere without us knowing. This process is called cleaning (or in simpler terms, deleting files). We'll have to use del to help us with cleaning. The del function takes in an array of node globs which tells it what folders to delete. Setting it up with a Gulp task is almost like the first "hello" example we had. Now Gulp will delete the `dist` folder for you whenever gulp clean:dist is run. Note: We don't have to worry about deleting the dist/images folder because gulp-cache has already stored the caches of the images on your local system. Phew, that's a mouthful. Let's combine all our tasks together now! Let's summarise what we've done. So far, we have created two distinct sets of Gulp tasks. The first set is for a development process, where we compiled Sass to CSS, watched for changes, and reloaded the browser accordingly. The second set consists of tasks that we need to run to create the production website. This includes clean:dist, sass, useref, images and fonts. If we went by the same train of thought, we could create a build task to combine everything together. Unfortunately, we wouldn't be able to write the build task this way because Gulp activates all tasks in the second argument simultaneously. There's a possibility that useref, images, or even fonts gets completed before clean does, which means the entire `dist` folder gets deleted. So, to ensure that cleans get completed before the rest of the tasks, we need to use an extra plugin called Run Sequence. When task-name is called, Gulp will run task-one first. When task-one finishes, Gulp will automatically start task-two. Finally, when task-two is complete, Gulp will run task-three. In this case, Gulp first runs task-one. When task-one is completed, Gulp runs every task in the second argument simultaneously. All tasks in this second argument must be completed before task-three is run. Why default? Because when you have a task named default, you can run it simply by typing the gulp command, which saves some keystrokes. Finally, here's a github repo for all the work we've done! We've gone through the absolute basics of Gulp and created a workflow that's able to compile Sass into CSS while watching HTML and JS files for changes at the same time. We can run this task with the gulp command in the command line. We've also built a second task, build, that creates a dist folder for the production website. We compiled Sass into CSS, optimized all our assets, and copied the necessary folders into the dist folder. To run this task, we just have to type gulp build into the command line. Lastly, we have a clean task that clears away from the generated dist folder any image caches that are created, allowing us to remove any old files that were inadvertently kept in dist. As you can see, even though the workflow we've created does quite a few things, there's a lot more that can be done. Creating a workflow that suits your needs can be extremely exciting and fulfilling, but it can be a lot to take in if you're new to this. Let me know what you felt about this article in the comments below! Oh yes, feel free to contact me if you have any questions on workflow. I'll be happy to reply! Great article – a lot of useful information presented in a way that should make sense to beginners and experienced developers alike. I noticed that in the first couple of examples (i.e. the Sass stuff) you’re not returning anything from the gulp task, and you’re not calling the callback argument. By not doing either of those two things, gulp will not know when the task has truly completed, which is no good if it’s used as a dependency of another task. Generally speaking, always return a stream (or promise), or call the callback argument. See notes on the gulp docs. The key thing to remember, as pointed out previously, is to handle asynchronous tasks correctly. Another thing to think about is organizing your gulpfile.js, especially across different projects. It’s possible to create your own npm package so that you can manage your gulpfile.js in a central place, rather than copy-pasting it each time. This is what we’ve done with our asset pipeline, which may serve as a good example if you’re interested in setting up your own. Another great example is Laravel’s Elixir. Thanks for the article. Which clearly expalins the gulp without comparing its peer grunt. I have doubt Here why callback is used in some task function and how to use task:varianttask i am new to this gulp. The callback is used to tell gulp.js that the task is done. This is important for asynchronous tasks which may past the duration of the task functions itself. See the gulp.js docs on asynchronous tasks. task and task:subTaskare both just task identifiers (the colon doesn’t mean anything to gulp.js). Some people like to use a colon to group tasks with related tasks. Great article! Gulp is a super helpful tool and I think it’s a lot faster than Grunt. Great article. I just built my first gulpfile yesterday and this covered a lot of things I learned by googling around. Haha. Thanks for writing it. It gave me some good ideas for further optimization. I already knew Grunt but I’m liking gulp better. Maybe a repeat comment but yeah, with Homebrew installed, no need to sudo for npm -g installs. I’m a full-time Grunt user but I appreciate you covering Gulp in depth in case I end up on a project that uses it in the build process. Good job! It looks like there is a typo. The structure of a webapp is “app/scss”. But task is “gulp.src(‘app/sass/styles.scss’)”. Anyway, you did a great job. Many thx! Hey Zell… Fantastic article… Feels like someone sitting beside and guiding explaining all details… Following you in twitter! This article is so amazing that it’s mind boggling O_O. Weird, everything worked up until the ‘clean:dist’ task. When running ‘gulp clean:dist’, it always starts the task but never finishes it. Consequence: the ‘build’ task doesn’t work either. When I clone your version from github and run the task, it works. When I copy your gulpfile.js to my solution, it has the same issue as I have. What am I missing? I can’t have ‘clean:dist’ task to work. I’ve installed del@1.2.1, as Zell points out, but the task isn’t working. When I type ‘gulp clean:dist’, it deletes everything inside the ‘dist’ directory, also the images folder. Bernat did you arrange your clean task in the order I mentioned? If you do, put your repo up on Github and send me a link. I’ll take a look. Gulpfile seems correct. Send me a link to your entire repo instead? I need to test it out. You should be using gulp 4.0 (alpha) and the third party gulp-watch library instead of gulp 3.x and gulp.watch recommended by this post. gulp 4.0 has built-in methods to explicitly run tasks in sequence or parallel, and gulp-watch notices files added while the build system is running. Comprehensive and thoroughly structured, as always, many thanks Zell! Have I missed something about gulp-sourcemaps trace? Does del clean up that long abracadabra line, at the end of css file, before minimization? Grab the 10 free chapters I put up at the end of the post. One of them deals with learning the command line so you know how, and where to use these bash commands. Let me know if you still have problems after reading through it. I’ll talk about that in a separate post. You can also find that info near the end of my book. Basically, use npm update, or the npm-check-updates package. 1) What’s ‘sass’ function doing in ‘build’ task? By that time everything is supposed to be compiled, as for me. 2) Should I have all .html files at the root folder “app” to run ‘useref’ correctly? Can I put all .html but not index.html to html folder? There may be times where changes are made, but are not compiled yet. Placing sass in the build task ensures that it’s definitely compiled. Hey thanks for this tutorial, it’s been really useful! The thing is that if I do this I cannot compile again unless I close the terminal and open it again. Thought it had to do with the runSequesnce task. Any ideas? Thanks! Hm, interesting. This is the first time I’ve seen something like this. Can you send me an email with your repo so I can have a closer look? I’m using codekit for most of these features, but I’m willing to try it out! If I ‘finally’ get everything working, is it easy to reuse it for next new projects? Yep it is. You just have to duplicate the gulpfle and package.json file (along with your project structure), then run npm install. There are a few plugins, like ‘uncss’ to delete idle css. Grate idea! Is there any confidence about preserving ‘idle css’ for html but, at the same time, active for .js? Does ‘uncss’ and alike take into account link to .js to inspect usefulness of styles? None of the authors has defined that, as I can see. You can choose to ignore certain CSS files when you use uncss. I’ll cover that in a separate blog post. I mean certain CSS styles. OK,ok, Zell, grate job! Seems there is a whole bunch of reasons to write even more advanced blog. But html validation may come to play. Great article. I’ve been avoiding task-runners in node for the longest time because I’ve disliked the cognitive load, so I’ve been doing everything task related in ruby… but I am much happier to be moving over to gulp, and this article was a fantastic tool for doing that. One minor nitpick.. when setting up my app structure I just did $touch index.html, leading to a disconnect as there was no HTML in the file. It may be worth adding a little to the preamble around creating the initial HTML. Why are you compiling your SCSS to app/css instead of the dist directory? Never mind, I read over the bit where you use gulp-useref to do that, sorry about that. I do have another question however. When developing, do you test unminified and unconcatenated files from the app or the dist directory? In some cases I’ve run into scenarios where both minified and unminified files were written to the dist directory and I assume that files are tested from there and only the minified files are used in production. What is best practice? I test from the app directory as much as possible since that’s the source code. There’s no real “best practice” at all. It all depends on what you believe in, and from that believe, you’ll adjust your own workflow accordingly. This is probably a little too much to talk about in a comment though. I’ve covered it extensively in the book I’ve written and I thought I’d just refer you there. Just get the sample chapters and you’ll have a feel of what I believe in. Sounds good! Thanks for the advice. I’m currently trying to develop my own and my team’s workflow for some time now so the book could sure come in handy! Just curious here, when tasks begin to run such as gulp watch, how do I stop them? I can still type into the terminal but nothing happens. It puts the index.html in the dist folder, but there isn’t any ‘main.min.js’ generated, like the post says. Where could I have gone wrong, I’ve been over the code several times and I believe it’s identical. The gulp-useref plugin doesn’t log anything to the command line so that’s normal. doesn’t It’s likely that you’ve made a small mistake somewhere. Please put a a github repo and send me a link via email. I’ll take a look at it. Do I have to execute (watch, useref) everytime? Hey Zell, thanks for great article, I’m starting using gulp thanks to you. I’m used to have “assets” folder for css, js, images and fonts. I have a problem with useref. I want my css and js to go to dist/assets and html to dist folder but I’m not sure if I can add two destinations. I don’t like hacky ways where I can create task for copying css and js to dist, and then task for deleting them from dist. Is there some simple solution for this? And useref will automatically output your js in the assets folder. Wow, thanks for such a fast reply. I’ve tried that and it didn’t work because of another bug. I’ve fixed that in the meantime and now it all works. Thanks man. Thanks for this tutorial, I learned alot. 1) You didn’t use –save-dev when installing gulp-minify-css. Did you do that on purpose or was it just a mistake? 2) When I use the build command, gulp creates a dist folder and copies all files where they’re supposed to be. So far so good. But when I run the build command a second time, Gulp just deletes the dist folder (as its supposed to do) and that’s it. It does not create a new one. I forgot to mention that all tasks are running though without error. At least that’s what the Shell says. Ah, okay. I tried adding a callback but then the task would stop after the cleaning. Of course I forgot the square brackets. Thank you very much. Okay, I celebrated to soon. It doesn’t work. It always stops after cleaning. This only works with del v1.2.1. Are you using it? Latest version of del is 2.0 right now. You were right. It is version 2.0.2. But rather than installing an older version I think I better try getting it to run with the latest one. Thanks.